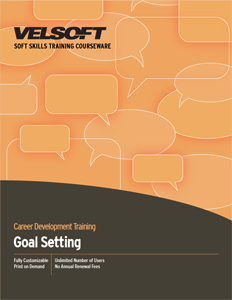 Goal Setting Training Materials is designed for teaching employees and supervisors how to understand the importance of setting attainable goals. Develop tactics for setting goals, creating vision statements, goal setting action plans and follow through and much more! Seeing is Believing This sample manual to teach Goal Setting is in MS Word format. Success is not accidental. It is a result of thorough planning, hard work, drive, and determination. This one-day goal setting course will help you teach participants how to set up a long-term life plan, create good goals, and achieve their dreams. Our training materials are designed to provide the busy trainer with everything they need to deliver a course with real impact. Instructor and student guides, a quick reference guide, supplementary reading list, PowerPoint slides, as well as detailed activities are included. This is a must-have course! With options to integrate blended learning opportunities, your training materials will be unforgettable!